As the January 25 Revolution anniversary approached and passed, V for Vendetta masks could be noticed all over the city: on protesters' faces; spray painted on walls; and even on the front page of the Freedom and Justice Party newspaper. 2011 saw the consistent appearance of the undeniably iconic mask that provides a friendly face for protestors yet a not so friendly one for leaders and security forces all over the world. First used in protest by the online Hacktivist group "Anonymous," then making several appearances in the Occupy movement in the United States, "V masks" have recently hit Egypt during the time of the 25 January anniversary, with protests calling for an end to military rule. While the film, V for Vendetta, released in 2006 was a hit around the world, making a gross income of $131,411,035 for Warner Brothers Studios, the story itself goes back a few decades. The film was adapted from a comic book written by Alan Moore and illustrated by David Lloyd. “It was political,” Lloyd told Ahram Online. “It was meant to tell something. It is a story about dictatorships everywhere.” Moore and Lloyd had created the story in the early 80s when the National Front (Britain's far-right party) was starting to gain power in Britain. Originally a 10-issue comic book some of which were originally published by Quality Comics in the UK within the comic magazine "Warrior" between 1982 and 1985, the full series was published by DC Comics in 1988 in colour. The comic is set in the future and is about a masked figure calling himself "V" who is out to destroy parliament and inspire people to revolt to save England from a fascist totalitarian government that spreads propaganda through the media and rules by the police state. The story reveals that V has been tortured in a concentration camp in Lark Hill, and is out for vengeance. He uses the regime’s propaganda machine against them, and stages a series of assassinations on leaders of the state. The mask V wore was inspired by the story of Guy Fawkes, famous for the "Gunpowder Plot" of 5 November 1605. This incident is referred to in the book and film alike. Fawkes was among a group planning an assassination attempt on the king of England, James I, along with blowing up the Houses of Parliament. Fawkes was caught and eventually told on his co-conspirators, the plan never coming to life. Every year on 5 November, British children wear Guy Fawkes masks made out of paper mache and light fireworks in commemoration of the failed plot. “My original plan was the use the same masks sold in stores,” Lloyd explained. However, since the story was in creation in May, and the masks are only sold nearer to November, Lloyd was pushed to come up with his own design. “The Guy Fawkes mask is a remembrance of what he looked like, and that is the mask V wears,” he said. “The rest of the costume is actually appropriate and authentic 17th century costume,” he added. V is a deep character, unique among normal superheroes that adorn comic books. He is well versed in the arts of explosives and fighting, and does not use guns but knives. More interestingly, he has a vast literary and cultural intellect, along with philosophical viewpoints that are for coexistence, tolerance and standing up to injustice. Protestors in the Occupy Wall Street movement, that has extended across the United States, have used the mask. The hacktivist group Anonymous also adopted it. Lloyd attributed the iconic symbolism of the mask to the story. “The mask means nothing without the story and general philosophy,” he said. According to Lloyd, in spite of the global sales and reach of the comic books, the film was what brought the story to audiences worldwide. The film played in cinemas in Egypt the year it was released. More recently, in front of the Merit Publishing House, located near Tahrir Square, a public screening of the film was hosted on 25 January 2012. 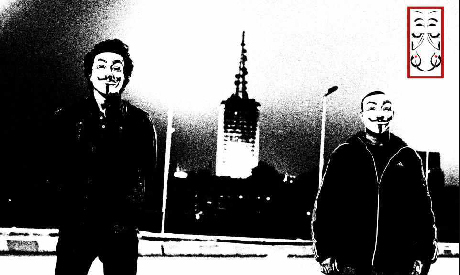 Leading up to the protests on 25 January 2012, a group of youth who identify themselves as ZanZan (an Egyptian term referring to repeating the same thing constantly) started posting YouTube videos on their channel of themselves wearing these masks, spray painting the streets with graffiti, and delivering messages of protest against the Supreme Council of the Armed Forces (SCAF). The names of ZanZan group members are changed as the group requested anonymity. “Everyone wants to be V. People see V as their revolution. They admire the character,” Ahmed, a member of the group, told Ahram Online. “We wanted to make these videos to deliver the message in a different way,” Amir, another member of ZanZan, told Ahram Online. “Our first instinct was to make our own masks, as we wanted to be anonymous.” However, due to logistical issues and the symbolism behind the V mask, the group ordered a set of V masks from abroad. The group’s videos were an online sensation, widely shared on social media sites. However, several pro-SCAF Facebook pages and a blog belonging to personnel of the interior ministry called them “foreign agents funded by the CIA” and “members of the April 6 Movement,” terms used widely when referring to revolutionaries calling for the continuation of protests and for SCAF to leave power. The group dismissed these allegations. Due to the humour in some of the videos, which feature the group wearing the masks and dancing in the street, some people criticised them, saying they were a joke. “Any new idea always meets resistance,” Amir said. “People will always criticise,” he added. The newspaper of the Freedom and Justice Party, the Muslim Brotherhood’s political arm, published a front page story in the days leading up to 25 January 2012 with a photo of a person in a V mask, claiming people wearing these masks are anarchists and are out to destroy the state. The headline read "Bendetta" which caused an online sensation, trending among Egyptian Twitter users with jokes spreading at the expense of the party and Brotherhood. Ahmed Gamal El-Din, a protestor and supporter of the ongoing Egyptian revolution, took the streets on 25 January 2012 wearing the mask. “I wore it to show that you should not believe everything you hear,” he explained, adding that over 60 people asked him about the mask and joked with him, calling him "Mr Bendetta." “It is a symbol of vengeance against all the injustice happening,” Gamal El-Din said. “People [in Egypt] took the symbolism of resisting a corrupt system, that is the same everywhere in the world,” Amir said. Rowan, Nice piece except there's no evidence Fawkes sold out his co-conspirators under torture. One interesting point about his execution - despite any suffering he may have experienced, he was strong enough and smart enough to climb as high as he could on the gallows ladder, so that when he was hung he broke his neck on the drop and died and didn't have to suffer the drawing and quartering that his fellows sadly did. Hi David, thanks again for the lovely chat, and for taking the time to read the article and comment. I had always thought that was the case, since the first time I read the story of Guy Fawkes when I visited York in 2009. I guess I wasn't 100% correct on the details. Very interesting though the point on his execution. he's definitely an interesting guy.